Steven Spielberg returns to cinema screens this week with an adaptation of Roald Dahl’s much-loved children’s book The BFG, and the film is an old-fashioned children’s movie of sorts. Forget Pixar’s mutton dressed as lamb: The BFG eschews any nods and winks to mum and dad – except for some humour late on – and instead translates Dahl’s fable to the screen with respect and invention. We begin in a twilight London’s as Sophie (Ruby Barnhill), an insomniac and precocious young girl, prowls the orphanage while the other children sleep, sorting the mail and enjoying the run of the place. Late one night, Sophie spies a looming shadow on the street and is spotted peeping by the Big Friendly Giant (Mark Rylance, working once more with Spielberg following his Oscar-winning turn in Bridge of Spies). She is snatched from her room and whisked away to the Land of the Giants where the BFG tells her she must stay to stop her from telling everyone about him. Reunited with his screenwriter from E.T: the Extra-Terrestrial, Melissa Mathison, the first half of the film takes its time to establish the relationship between Sophie and her new friend in what is essentially a two-hander, with Rylance having huge fun with his bumbling, language-garbling colossus. The BFG offers the sort of companionship Sophie never had, the protection she seeks and a moral centre. His job is the capturing and scripting of dreams. 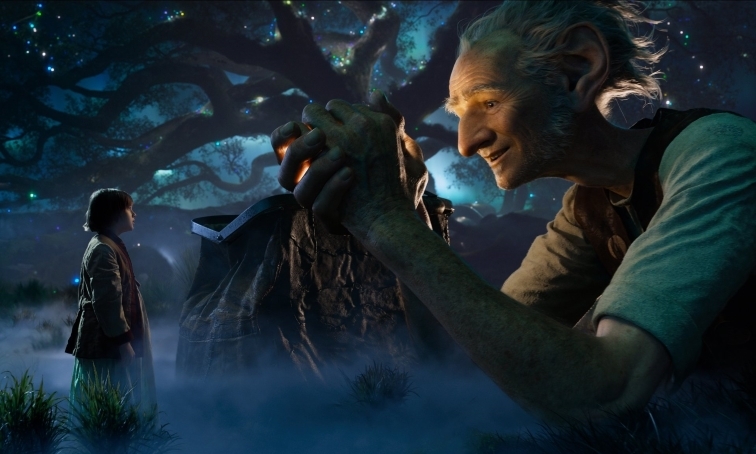 Like a massive Prospero, the BFG is also perhaps a surrogate for Spielberg himself, a ‘dreamworker’ whose subject when it comes to his children’s movies is the relief of childhood loneliness. Importantly, the BFG is also a vegetarian and must eat disgusting Snozzcumbers instead of drinking the blood of Englishmen. Unfortunately, he is not alone and is in fact the runt of the litter. The other giants are more traditionally fee-fi-fo-fum about their calling, with blood curdling names like Fleshlumpeater (Jermaine Clement) and Blood Bottler (Bill Hader), and Sophie is in imminent danger of becoming a snack. Should the BFG return her to the orphanage and relative safety or should they together try to defeat the bigger unfriendly giants? Always visually inventive, Spielberg delights in the idea of scale here with ingenious solutions for the BFG’s home and a very funny sequence in Buckingham Palace. Action sequences are used sparingly – there’s a battle of sorts – with the film more intent on the emotions of the characters. That The BFG works is down to the performances. Rylance, as already noted, is superb and he manages to shine through the CGI with genuine compassion, decency and occasionally pathos. Eye-catching newcomer Barnhill more than holds her own, her pluck and courage a perfect rendition of Dahl’s character. There are moments of real wonder and delight and Quentin Blake’s original illustrations are occasionally glimpsed in the set ups. This isn’t an epic of visual wizardry and there’s zero irony or clever wit. Rather, Spielberg’s latest is an old-fashioned children’s tale told simply and with plenty of heart.